The Ostrich Nest is part of the Ostriches (an-na’a’im) celestial complex, which includes the Drinking Ostriches (an-na’am al-warid), the Returning Ostriches (an-na’am as-sadir) and the Wasteland (al-balda). 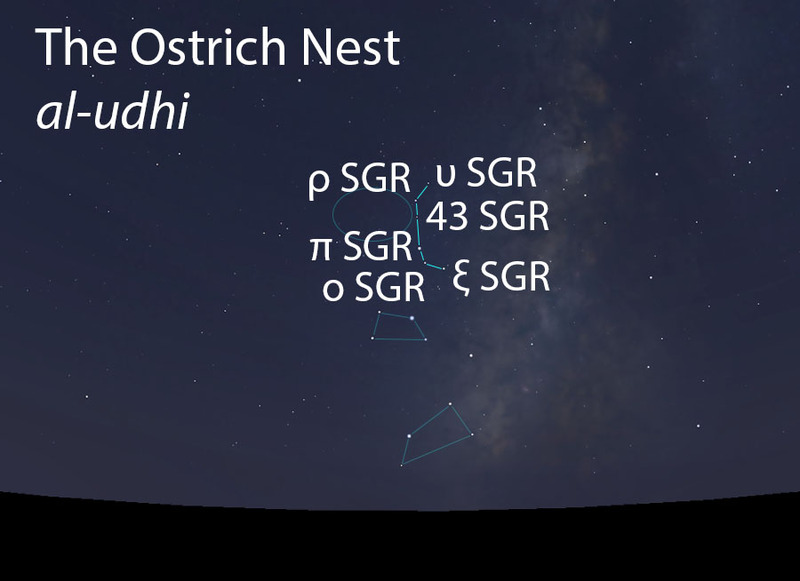 The Nest is so named because its stars form a wide arc, which resembles the way that ostriches separate their eggs widely from each other. The Nest is located near the Returning Ostriches, who have already drunk from the river (the Milky Way, where the Drinking Ostriches are) and are now walking away from it to return home to their Nest with its eggs. 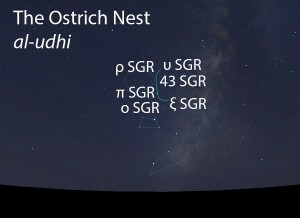 The Ostrich Nest (al-udhi) as it appears in the west about 45 minutes before sunrise in late June. Sky simulations made with Stellarium. A grouping of six stars arranged in a wide arc above the Ostriches. The Ostrich Nest does not figure in the calendar of the rains stars. The Ostrich Nest is not one of the lunar stations. The Ostrich Nest is part of the Ostriches (an-na’a’im, النعائم) folkloric celestial complex.